Monolatry (Greek: μόνος (monos) = single, and λατρεία (latreia) = worship) is belief in the existence of many gods but with the consistent worship of only one deity. The term "monolatry" was perhaps first used by Julius Wellhausen. Monolatry is distinguished from monotheism, which asserts the existence of only one god, and henotheism, a religious system in which the believer worships one god without denying that others may worship different gods with equal validity. The pharaoh Akhenaten - who was initially enthroned as Amenhotep IV - initially introduced Atenism in Year 5 of his reign (1348/1346 BCE) during the Eighteenth Dynasty of Egypt. He raised Aten, once a relatively obscure solar deity representing the disk of the Sun, to the status of supreme deity in ancient Egyptian religion. Year 5 marked the beginning of his construction of a new capital, Akhetaten "Horizon of the Aten", at the site known today as Amarna. Amenhotep IV officially changed his name to Akhenaten "Agreeable to the Aten" as evidence of his new worship. In addition to constructing a new capital in honor of Aten, Akhenaten also oversaw the construction of some of the most massive temple complexes of ancient Egypt, including one at Karnak and one at Thebes close to the old temple of Amun. In his ninth year of rule (1344/1342 BCE), Akhenaten declared a more radical version of his new religion, declaring Aten not merely the supreme god of the Egyptian pantheon but the only God of Egypt, with himself as the sole intermediary between the Aten and the Egyptian people. Key features of Atenism included a ban on idols and other images of the Aten, with the exception of a rayed solar disc in which the rays (commonly depicted ending in hands) appear to represent the unseen spirit of Aten. Aten was addressed by Akhenaten in prayers, such as the Great Hymn to the Aten. The details of Atenist theology are still unclear. The exclusion of all but one god and the prohibition of idols was a radical departure from Egyptian tradition, but most scholars see Akhenaten as a practitioner of monolatry rather than monotheism, as he did not actively deny the existence of other gods; he simply refrained from worshiping any but Aten. It is known that Atenism did not solely attribute divinity to the Aten. Akhenaten continued the imperial cult, proclaiming himself the son of Aten and encouraging the people to worship him. The people were to worship Akhenaten; only Akhenaten and the pharaoh's wife Nefertiti could worship Aten directly. Under Akhenaten's successors, Egypt reverted to its traditional religion, and Akhenaten himself came to be reviled as a heretic. Some historians have argued that ancient Israel originally practiced a form of monolatry or henotheism. Both Frank Eakin, Jr. and John Scullion believe Moses was a monolatrist rather than a monotheist, and John Day suggests that angels are what became of the other gods once monotheism took over Israel. John McKenzie has stated: "In the ancient Near East the existence of divine beings was universally accepted without questions. ... The question was not whether there is only one elohim, but whether there is any elohim like Yahweh." Some scholars claim the Torah (Pentateuch) shows evidence of monolatry in some passages. The argument is normally based on references to other gods, such as the "gods of the Egyptians" in the Book of Exodus (Exodus 12:12). The Egyptians are also attributed powers that suggest the existence of their gods; in Exodus 7:11-13, after Aaron transforms his staff into a snake, Pharaoh's sorcerers do likewise. In the ancient Near East, magic was generally believed to exist, though the Israelites viewed magic as being malign in origin and were forbidden from it. With regard to miracle and prophecy, the Bible commands the Israelites not to follow false prophets (those who compromise the law) and not to refrain from putting them to death. The miracles of false prophets are, like those of the Egyptian sorcerers, regarded by the Israelites as a divine test to see if the Israelites "love the LORD [their] God with all [their] heart and with all [their] soul". The Ten Commandments have been interpreted by some as evidence that the Israelites originally practiced monolatry. 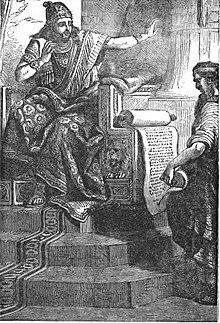 Exodus 20:3 reads "Thou shalt have no other gods before me", (Hebrew:לא יהיה־לך אלהים אחרים על־פני), and they argue that the addition of "before me" at the end of the commandment indicates that not only other gods may exist but that they may be respected and worshiped so long as less than Yahweh. There is evidence that the Israelites before the Babylonian Exile in the 6th century BCE did not adhere to monotheism. Much of this evidence comes from the Bible itself, which records that many Israelites chose to worship foreign gods and idols rather than Yahweh. During the 8th century BCE, the monotheistic worship of Yahweh in Israel was in competition with many other cults, described by the Yahwist faction collectively as Baals. The oldest books of the Hebrew Bible reflect this competition, as in the books of Hosea and Nahum, whose authors lament the "apostasy" of the people of Israel and threaten them with the wrath of God if they do not give up their polytheistic cults. On the other hand, medieval scholars often interpreted ancient texts to argue that the ancient Israelites were monotheistic. The Shema Yisrael is often cited as proof that the Israelites practiced monotheism. It was recognized by Rashi in his 11th century commentary to Deuteronomy 6:4 that the declaration of the Shema accepts belief in one god as being only a part of Jewish faith at the time of Moses but would eventually be accepted by all humanity. God, the Cause of all, is one. This does not mean one as in one of a pair, nor one like a species (which encompasses many individuals), nor one as in an object that is made up of many elements, nor as a single simple object that is infinitely divisible. Rather, God is a unity unlike any other possible unity. This is referred to in the Torah (Deuteronomy 6:4): "Hear Israel, the Lord is our God, the Lord is one." Paul the Apostle, in his First Epistle to the Corinthians, writes that "we know that an idol is nothing" and "that there is none other God but one" (1 Corinthians 8:4-6). He argues in verse 5 that "for though there be that are called gods, whether in heaven or in earth", "but to us there is but one God". Paul distinguishes between gods that have no authority or have a lesser authority, "as there be gods many, and lords many", and the one God who has universal authority, "one God, the Father, of whom are all things" and "one Lord, Jesus Christ, of whom are all things". Some translators of verse 5, put the words "gods" and "lords" in quotes to indicate that they are gods or lords only so-called. In his Second Epistle to the Corinthians, Paul refers to "the god of this world" (2 Corinthians 4:4), which the eighteenth-century theologian John Gill interpreted as a reference to Satan or the material things put before God, such as money, rather than acknowledging any separate deity from God. 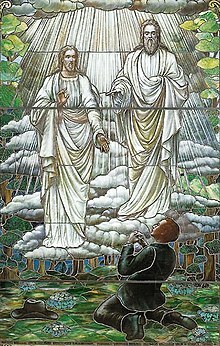 The Church of Jesus Christ of Latter-day Saints (LDS Church) teaches that God the Father, Jesus Christ and the Holy Ghost are three distinct beings belonging to one Godhead: "All three are united in their thoughts, actions, and purpose, with each having a fullness of knowledge, truth, and power." Latter-day Saints further believe that prayer should be directed to only God the Father in the name of Jesus Christ. We believe these three divine persons constituting a single Godhead are united in purpose, in manner, in testimony, in mission. We believe Them to be filled with the same godly sense of mercy and love, justice and grace, patience, forgiveness, and redemption. I think it is accurate to say we believe They are one in every significant and eternal aspect imaginable except believing Them to be three persons combined in one substance. Latter-day Saints interpret Jesus' prayer in John 17:11, "Holy Father, keep through thine own name those whom thou hast given me, that they may be one, as we are" to refer to the characteristics, attributes and purpose that the Son shares with the Father in the hope that people can someday share in those as well. In Mormonism, being one with God means gaining immortality, perfection, eternal life, and the highest level in his kingdom. As D. Todd Christofferson states, "we may become one with God" as Jesus did. Joseph Smith taught that humans can become joint-heirs with Christ and thereby inherit from God all that Christ inherits if they are proven worthy by following the laws and ordinances of the gospel. This process of exaltation means that humans can literally become gods through the atonement; thus, "god" is a term for an inheritor of the highest kingdom of God. That allows for the existence of many gods in the future, but only one as ruler over life in this universe. To the extent that monolatry is not considered monotheism, the classification of Mormonism as monolatrous is strongly disputed among Latter-day Saints. Bruce R. McConkie stated that "if [monotheism] is properly interpreted to mean that the Father, Son, and Holy Ghost — each of whom is a separate and distinct godly personage—are one God, meaning one Godhead, then true saints are monotheists." ^ Frank E. Eakin, Jr. The Religion and Culture of Israel (Boston: Allyn and Bacon, 1971), 70. ^ Mackintosh, Robert (1916). "Monolatry and Henotheism". Encyclopedia of Religion and Ethics. VIII: 810. Retrieved Jan 21, 2016. ^ "Ancient Egypt Gods: The Aten". www.ancientegyptonline.co.uk. Retrieved 5 April 2018. ^ Hart, George (2005). The Routledge dictionary of Egyptian gods and goddesses (2nd ed.). Routledge. p. 39. ISBN 978-0-415-34495-1. ^ Frank E. Eakin, Jr. The Religion and Culture of Israel (Boston: Allyn and Bacon, 1971), 70 and 263. ^ Frank E. Eakin, Jr. The Religion and Culture of Israel (Boston: Allyn and Bacon, 1971), 107 and 108. ^ John J. Scullion, "God (OT)," in David Noel Freedman, ed., The Anchor Bible Dictionary, six volumes (New York: Doubleday, 1992), 2:1042. ^ John Day, "Canaan, Religion of," in David Noel Freedman, ed., The Anchor Bible Dictionary, six volumes (New York: Doubleday, 1992), 1:835. ^ John L. McKenzie, "Aspects of Old Testament Thought" in Raymond E. Brown, Joseph A. Fitzmyer, and Roland E. Murphy, eds., The New Jerome Biblical Commentary (New Jersey: Prentice Hall, 1990), 1287, S.v. 77:17. ^ Raymond F. Collins, "Ten Commandments," in David Noel Freedman, ed., The Anchor Bible Dictionary, six volumes (New York: Doubleday, 1992), 6:385. 9 And He said unto me: 'Go in, and see the wicked abominations that they do here.' 10 So I went in and saw; and behold every detestable form of creeping things and beasts, and all the idols of the house of Israel, portrayed upon the wall round about. 11 And there stood before them seventy men of the elders of the house of Israel, and in the midst of them stood Jaazaniah the son of Shaphan, every man with his censer in his hand; and a thick cloud of incense went up. 12 Then said He unto me: 'Son of man, hast thou seen what the elders of the house of Israel do in the dark, every man in his chambers of imagery? for they say: The LORD seeth us not, the LORD hath forsaken the land.' 13 He said also unto me: 'Thou shalt again see yet greater abominations which they do.' 14 Then He brought me to the door of the gate of the LORD'S house which was toward the north; and, behold, there sat the women weeping for Tammuz. 15 Then said He unto me: 'Hast thou seen this, O son of man? thou shalt again see yet greater abominations than these.' 16 And He brought me into the inner court of the LORD'S house, and, behold, at the door of the temple of the LORD, between the porch and the altar, were about five and twenty men, with their backs toward the temple of the LORD, and their faces toward the east; and they worshipped the sun toward the east. But where are thy gods that thou hast made thee? Let them arise, if they can save thee in the time of thy trouble; for according to the number of thy cities are thy gods, O Judah. ^ "1 Corinthians 8:5b, in the NKJV and several versions". Retrieved 19 March 2013. ^ Dahl, Paul E. (1992). "Godhead". In Ludlow, Daniel H (ed.). Encyclopedia of Mormonism. New York: Macmillan Publishing. pp. 552–553. ISBN 0-02-879602-0. OCLC 24502140. ^ Blanch, Mae (1992). "Prayer". In Ludlow, Daniel H (ed.). Encyclopedia of Mormonism. New York: Macmillan Publishing. pp. 1117–1120. ISBN 0-02-879602-0. OCLC 24502140. ^ Widmer, Kurt (2000), Mormonism and the Nature of God: A Theological Evolution, 1830-1915, Jefferson, NC: McFarland, p. 6, ISBN 978-0-7864-0776-7, OCLC 43615415 . Robert Needham Cust (1895). Essay on the Common Features which Appear in All Forms of Religious Belief. Luzac & Co.
Robert Wright (journalist), The Evolution of God (2009) (esp. pages 132 et seq discussing conflict between Elijah and Jezebel).